In a highly publicized and long drawn out battle that had Los Angeles and Long Beach port truck drivers strike multiple times throughout 2014, the new year is off to a good start in finally bringing this to a resolution. 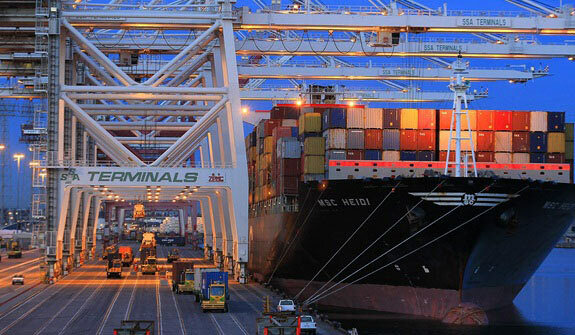 On Tuesday, it was announced that the union seeking to represent the Los Angeles and Long Beach port truck drivers and a major trucking firm made an agreement that would give their truck drivers the freedom to decide whether or not to unionize. Shippers Transport Express is a company based in Carson, California and a wholly owned subsidiary of SSA Marine. The International Brotherhood of Teamsters and supporters have announced their plans to hold a press conference this Friday, where they will validate the truck drivers’ union authorization cards and open the door for the Teamsters to begin negotiating a contract. According to the Teamsters and Justice for Port Drivers, the company that has entered into this new agreement has chose to move from an independent contractor business based model to an employee-based drayage business - effective January 1st, 2015. The independent contractor model is the very point of contention for many port truck drivers who have been working for trucking firms. The truck drivers argue that the model allowed the trucking firms to sidestep labor laws and basically avoid paying drivers their full wages. Both parties entered in the new agreement have conceded on a neutral process of unionization, which specifically stipulates that the employer promises not to interfere in or influence their truck drivers’ decision to unionize. The Teamsters also promise not to belittle or disrupt Shippers Transport with picket lines or other job related actions. Once a certain quota of truck drivers have signed valid union authorization cards and they are verified by a neutral third-party, Shippers Transport must recognize Teamsters Local 858 as the official representative for its drivers. Not only does this mark a major victory for the truck drivers affected by this agreement, it has paved the way for many other port truck drivers to enter similar agreements with the major trucking firms employing them. After a tiring fight that lasted well over a year and included strikes to bring attention to their cause and some even filing wage theft claims against their employers, the port truck drivers are finally on their way to the better pay and improved working conditions that they deserve. A recent report released by advocacy groups claimed that two-thirds of U.S. port truck drivers who haul goods from U.S. seaports are misclassified as independent contractors. However, critics have suggested that the majority of these drivers want to remain independent contractors for the flexibility and freedom to own their own trucks and their own small businesses. What is your opinion on this new agreement and the independent contractor situation in general?